"The famous Consumer Price Index is meant to measure inflation, but ignores obvious costs of living items like food and energy usage .. The Fed and others overstate economic growth in the U.S. .. The Fed hides the fact that living standards have been in sharp decline in the U.S. for decades .. More and more members of the media are beginning to note that the Fed has an incredibly terrible record of forecasting growth. This has lead to increased scrutiny of the Fed’s policies and methods for forecasting. Which is FINALLY leading to some disclosures about how the Fed measures inflation .. The Fed is run by money printers. They cannot generate growth, they can only depreciate the U.S. Dollar to create inflation. Inflation is coming... you need to prepare now." 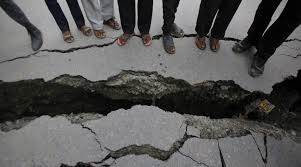 "Cracks are beginning to emerge in The Big Lie"